addictive brownies a new household favorite! Coffee is my life. Yes, it is true. I can't get my day started without a cup. That's it though, just one cup is usually all I need. Now there may be a day or two where I need an extra boost and I have two, but most days one does me just fine. My love for all things chocolate also runs deep. Whether it's in the form of a chocolate bar, a cake, a cookie or even a protein bar, I love having a little bite of chocolate each day. 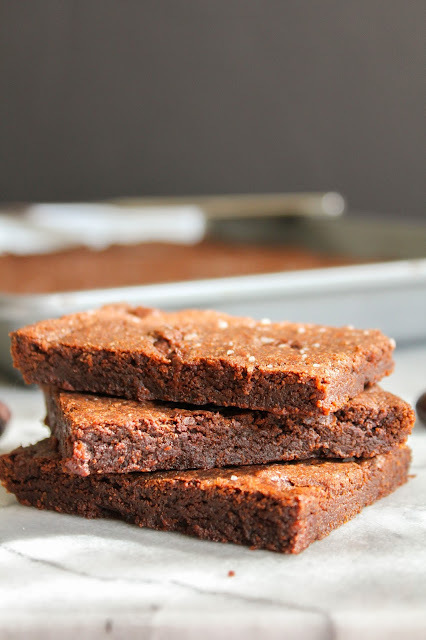 With that being said, I'm sure you're not too surprised that I made these amazing Salted Espresso Brownies. I mean, chocolate and espresso together? With a bit of salt sprinkled on top? That's pure heaven right there people. This is the simplest of recipes, too, because it's made in one bowl. I love anything that's made in one bowl. Less mess, less clean up. AND CHOCOLATE. Who doesn't love that?! 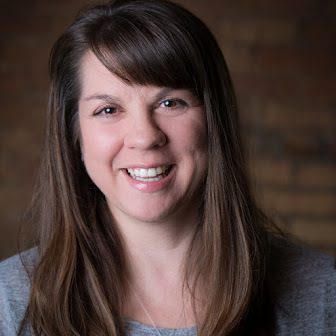 You may remember that back in June I attended the Eat Write Retreat food bloggers conference in Chicago. That conference was a blast and I learned so much! I miss my peeps and wish I could go back right now! I met a lot of awesome people, including some amazing brands, one of which was Calphalon. Just recently they were gracious enough to send me a GORGEOUS Calphalon 10-pc. Nonstick Bakeware Set! 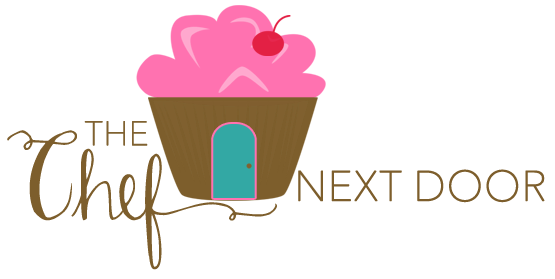 I've already been baking up a storm and have used several of the pieces, and they truly are amazing. When they say nonstick, they mean it! I've not sprayed my pans one single time, and everything has came out effortlessly. That is something so important to a baker! These rich and decadent brownies were made in the Calphalon 9"x13" Brownie Pan. 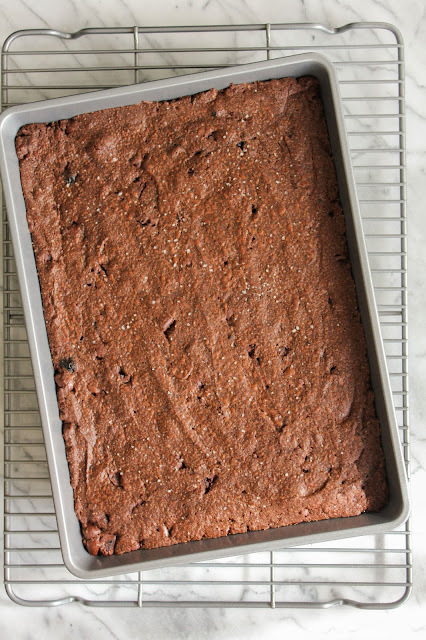 I loved using this pan because the brownies came out a little thinner than usual, so they were light and just a little crispy. 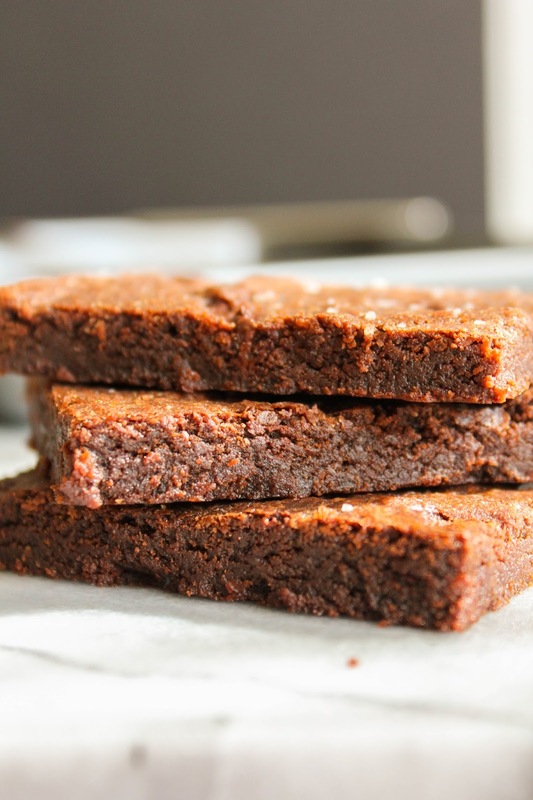 With chopped dark chocolate covered espresso beans throughout the brownies, they were the perfect texture. And guess what? 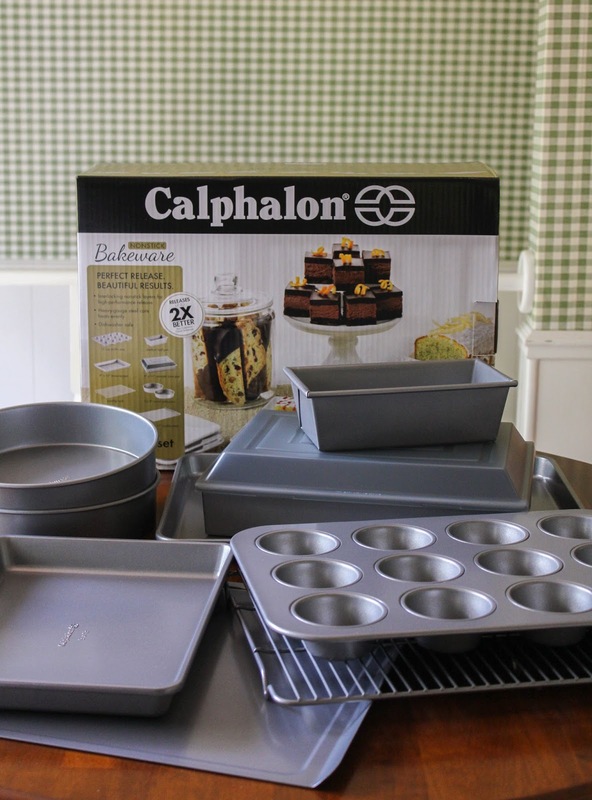 Lucky for you, Calphalon is offering one of these glorious 10-pc. Nonstick Bakeware Sets to one of my readers! WOO HOO! Now you can make these delicious brownies in your very own brownie pan. Or you can make muffins, or bread, or a cake, or whatever you choose to bake! How awesome is that?!?! Just head to the giveaway tool at the end of this post and enter to win! But for now, let's make some brownies! Put the butter and unsweetened chocolate in a large mixing bowl. Microwave on high for about 2 minutes, in 30-second intervals, stirring when done each time, until melted and smooth. Add the sugar and whisk until combined. Add the vanilla and eggs and whisk until combined. Next add in the flour, espresso powder and 1/4 teaspoon salt and mix until combined. 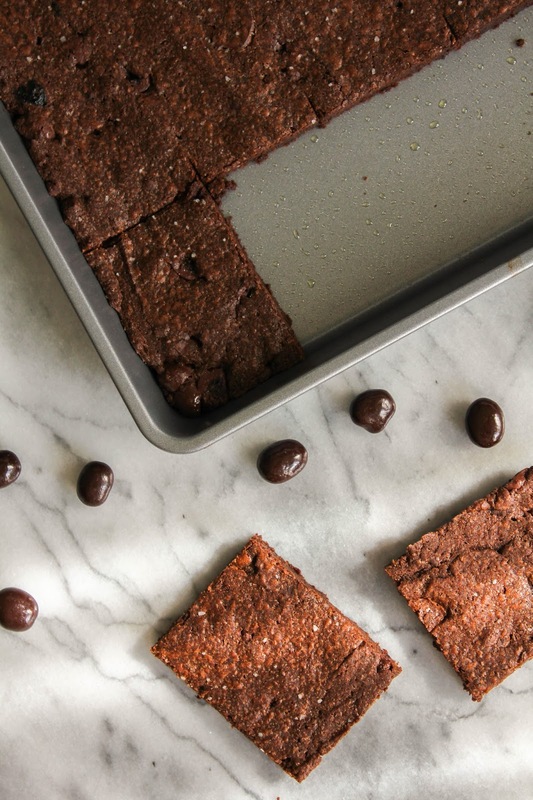 Roughly chop the espresso beans, then fold them into the brownie batter. Pour the batter into the Calphalon 9"x13" Brownie Pan, using the back of a rubber spatula to smooth out evenly. Sprinkle the kosher salt evenly over the top of the batter. Bake for 15 minutes. Allow to cool completely before cutting into squares and serving. Store leftovers in an airtight covered container. Disclaimer: I received Calphalon products at no charge to facilitate this post and giveaway. All opinions, as always, are my own.